Easter crafts for kids allow children to exercise their creativity while incorporating traditional Easter themes. These cute and easy Easter crafts can be made with supplies that are easy to find, and the projects are perfect for parents and kids to make together. No matter what your child's skill or interest level, you're sure to find a craft that will appeal. These Easter craft ideas can be made independently, or used to entertain a large group of children. Lambs are a cute decoration for Easter time, and it's really easy to make a lamb out of cotton balls and other things you have around the house. Cut an egg cup out of an empty egg carton. Place the egg cup open side down and cover it with glue. Stick cotton balls on the egg cup until it is completely covered. Decorate with craft eyes and ears cut out of construction paper. Coat the insides of each egg half with petroleum jelly, then set the halves upright in the egg carton. In the paper cup, mix together 1/4 cup of plaster of Paris, two tablespoons of powdered tempera paint in the color of your choice, and two tablespoons of cold water. Fill each egg half almost to the top with the mixture. Wait a few minutes until the mixture appears to have a mud-like consistency, then combine the two halves and briskly shake the egg to make sure the chalk is completely mixed. Let the eggs dry overnight, then remove from the mold. Use the tip of a table knife to remove the chalk egg if needed. If you're looking for something a little more interesting than the traditional Easter basket, why not have your kids decorate their own little Easter goodie bags? Decorate the bags with stickers, buttons, glitter and other materials. Line the bottom of the bags with Easter grass to help cushion the eggs. Create a cute Easter bunny candy holder for jelly beans or other sweet treats. Cover the top of the lid with craft glue. Pull three or four cotton balls apart, then attach to the top and sides of the lid. Add wiggle eyes and a pink felt triangle to give your bunny a face. Cut oval shapes from the white and pink felt to make ears for the bunny. Glue the ears to the back of the jar lid. Screw the lid back onto the candy filled jar. Glue a cotton ball to the back of the jar to give your bunny a tail. Tie a scrap of ribbon around the top of the jar to give the bunny a bow tie. There are plenty of egg decorating ideas, but here's a craft for those who don't want to decorate real eggs. This is a great craft if you want to have an Easter tree. Decorate the eggs using beads, glitter, markers and glue. Use straight pins to attach the ends of a ribbon to the top of the egg. 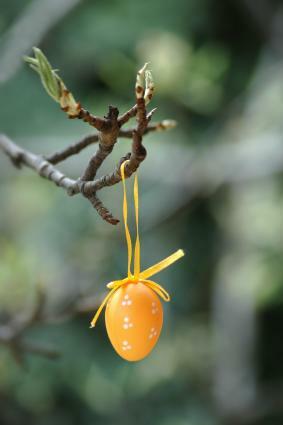 Hang the eggs from a tree in your yard or anywhere in the home. A really cute Easter craft for kids is making bunny ears to wear during the Easter egg hunt or for any other festive Easter occasion. Cut out a piece of poster board or card stock long enough to go around your child's head and a few inches wide. Cut out bunny ear shapes from the poster board, and smaller ear shapes out of pink construction paper. Glue the pink part of the ears to the white part of the ears, and attach the ears to the crown part, making sure that the ears will be positioned correctly on your child's head. Trim the crown to fit and staple or tape closed. Allow your child to decorate the crown with stickers, markers, stamps, glitter, or whatever else they like. With a little paint and some craft wood you and your children can make a really cute Easter bunny pin. Paint the round wood piece and the two larger teardrops white, and the smaller teardrops pink. Use wood clue or craft glue to attach the pink parts of the ears to the white parts of the ears, and the ears to the head. Add eyes, a nose and draw on a mouth. Attach a pin to the back and you'll have a very cute bunny pin to wear all spring long. 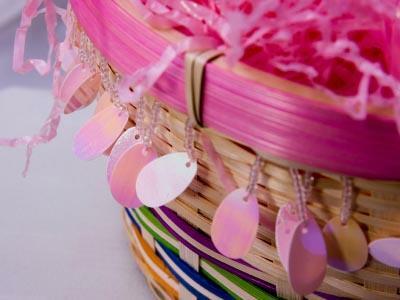 You could also make this craft and attach it to the side of a plain wicker basket to make a cute country Easter basket. This year, kick your creativity into high gear and do more for Easter than just decorating some eggs. 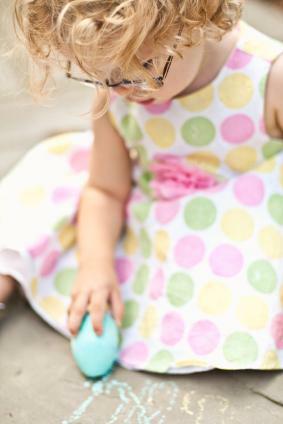 Start new Easter traditions and memories by creating some fun crafts together as well.